QuickBooks supports the creation and tracking of sales receipts. It manages the mechanics of this important task incredibly well. It eliminates the need to enter receipt data twice, once on a paper copy for your customer and again in your accounting system. This QuickBooks feature not only minimizes errors but saves time and lessens the possibility of disputes down the road. If you’ve already entered your customer and item/service records in QuickBooks, you can record your sale very quickly here. Even if you haven’t, or if you need to create a new record on the fly, you can select <Add New> when you open the drop-down option lists for the Customer: Job and Item fields. 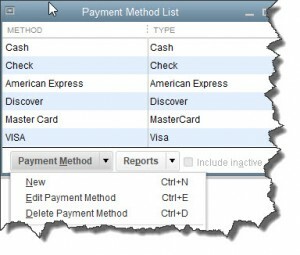 Did you know you can modify the list of payment methods available in QuickBooks? Click Lists | Customer & Vendor Profile Lists | Payment Method List. There are two primary ways to record income from customers in QuickBooks: Receive Payments and Create Sales Receipts. Do you know when each should be used? Analyzing your company’s cash flow is more complicated than simply comparing income to expenses. We can help you understand how this works, and why you need to know. QuickBooks comes with a template for creating sales receipts, but you have the ability to modify it if needed. Ask us about the software’s customization tools.